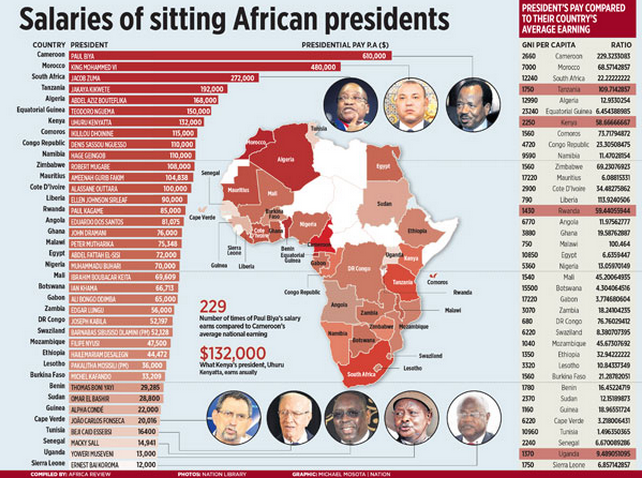 Think about it for a second: Paul Biya earns $210,000 more than Barack Obama. Notice that these figures do not include all manner of allowances. *Note that the interns at the Daily Nation mixed up Mauritania and Mauritius. The CNN bug is contagious. Uganda is experiencing hike in food and fuel prices – partly because of the rise in global oil prices but also because of “election money.” The Ugandan opposition has been organizing “walk to work” protests against the government’s inability to tackle inflation. In this video, the main opposition leader in Uganda gets to experience the full force of Museveni’s thugs security forces. Museveni’s rule in Uganda will only get stronger because of the recent discovery of oil in the country. So much for someone who 25 years ago when he first assumed power was seen to represent a new crop of African leaders who were poised to usher in the era of African prosperity. Increasingly in Museveni I see a bungling but eloquent Paul Biya with a touch of faux egalitarianism. YESTERDAY it was Afghanistan and Congo. Today it is Côte d’Ivoire and Libya. Violence, it seems, is always with us, like poverty. And that might seem all there is to be said: violence is bad, it is worse in poor countries and it makes them poorer. But this year’s World Development Report, the flagship publication of the World Bank, suggests there is a lot more to say. Violence, the authors argue, is not just one cause of poverty among many: it is becoming the primary cause. Countries that are prey to violence are often trapped in it. Those that are not are escaping poverty. This has profound implications both for poor countries trying to pull themselves together and for rich ones trying to help. Many think that development is mainly hampered by what is known as a “poverty trap”. Farmers do not buy fertiliser even though they know it will produce a better harvest. If there is no road, they reason, their bumper crop will just rot in the field. The way out of such a trap is to build a road. And if poor countries cannot build it themselves, rich donors should step in. Yet the World Development Report suggests that the main constraint on development these days may not be a poverty trap but a violence trap. Peaceful countries are managing to escape poverty—which is becoming concentrated in countries riven by civil war, ethnic conflict and organised crime. Violence and bad government prevent them from escaping the trap. Interesting piece. It is particularly important to note that violence affects everyone’s investment decisions, whether rich or poor. The thing about poor places is that everyone is poor, elite or not. No matter that Theodore Obiang’s son is buying the second most expensive boat in the world. If he has to hop on a plane to LA to have fun – instead of say, creating Africa’s Dubai in oil-rich Equatorial Guinea – he and his father remain tin pot dictators. The same applies for Idris Deby of Chad, Biya of Cameroon and many others. These dictators may have property abroad but the fact that they cannot accumulate property at home because of structural insecurity of their property rights (a coup is always a crazy junior officer away) continues to confine their countries to penury. What do you do when even the dictator does not have stable property rights? How can you develop when no one is secure enough to invest in factories?